Brownies, frosting and candy - a child's dream treat! Using the first five ingredients, prepare brownies according to package directions in a 9x9-inch pan. Cool to room temperature (approximately an hour). In a medium bowl, beat cream cheese until smooth. At low speed, gradually add the Nesquik. Frost cooled brownies with the cream cheese frosting. 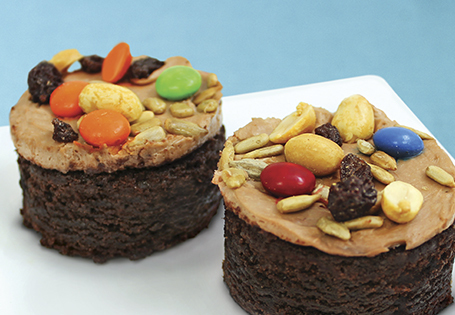 Sprinkle with the nut assortment, press pieces lightly into frosting. Place pan in the refrigerator for 20 minutes or until frosting has set, cut into 12 pieces.